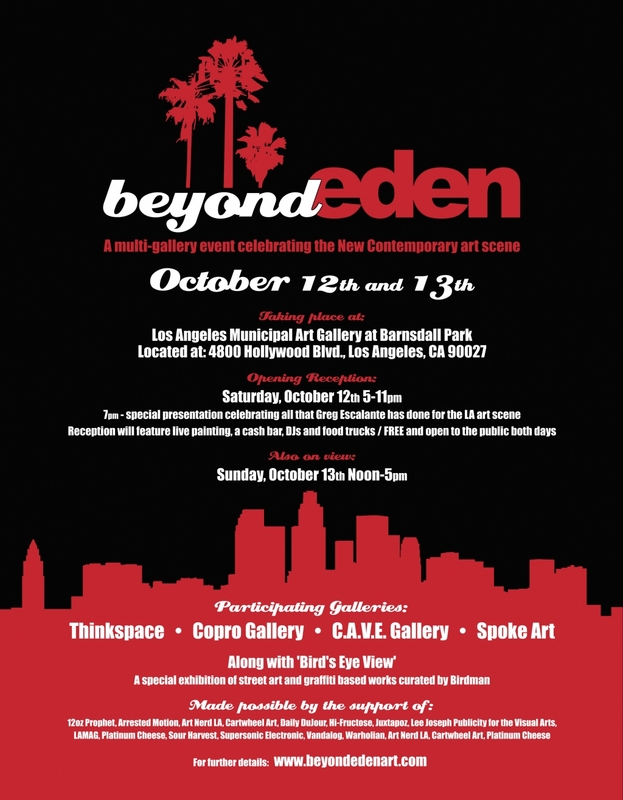 The fourth edition of Beyond Eden will once again be hosted by the Los Angeles Municipal Art Gallery at Barnsdall Park this coming October. Beyond Eden is a multi-gallery event celebrating the New Contemporary Art Movement in Los Angeles put together by Andrew Hosner (co-owner / curator at Thinkspace). The public is invited to attend this special event and admission is free. Each successive Beyond Eden event grows larger and larger with average attendance well over 5,000 the past two years. The New Contemporary Art movement continues to build momentum on a national level and is finally starting to receive mainstream recognition from major institutions and publications the world over. With its foundation firmly planted in Southern California and a patron base here in Los Angeles that has been building over the past several decades, it’s easy to see why Beyond Eden has been welcomed with such open arms by the Los Angeles arts community and has become an anticipated annual event. Beyond Eden 2013 will showcase the works of four of California’s finest New Contemporary Art galleries and will be held during the weekend of October 12th and 13th with an opening night celebration planned for Saturday, October 12th. Participating galleries include C.A.V.E. Gallery (Venice, CA), Copro Gallery (Santa Monica, CA), Spoke Art (San Francisco, CA), and Thinkspace (Culver City, CA). In addition to the works on display from the participating galleries, Beyond Eden 2013 will also feature live painting demonstrations throughout the gallery inside and out alongside a special showcase of Los Angeles street and graffiti artists presented by Thinkspace and curated by local photographer Birdman. This year will also see the tradition continue of honoring those that help to push our movement forward. This year’s honoree will be Greg Escalante (Juxtapoz Magazine / Copro Gallery). Birdman is the alter ego of Bryan Mier, a 25-year-old Los Angeles native photographer specializing in documenting urban art. A classically trained guitarist, Birdman originally set out to work on the business side of the music industry. Things changed when he picked up a camera and started taking pictures of street art and graffiti he stumbled upon in Los Angeles and Italy. Initially, Birdman started snapping photos around the city at night as a hobby. Realizing there was a lack of coverage of LA’s street art, he utilized Flikr and social media sites to share his images. His work quickly gained recognition from the art community. Before he knew it he was asked to serve as a correspondent for several magazines, gallery owners sought him out to cover their artists, he was even flown out to document artist’s murals and attend art fairs. What sets Birdman’s work apart from similar photographers is his emphasis in the artist and commitment to his craft. He establishes relationships with his subjects and puts in the time to ensure he gets the best shots, often seeing the entire process of a mural from start to finish. By allowing the artists to open up to him he captures their personality in his shots-a quality that is lacking in other’s coverage. Due to the temporary nature of street art, Birdman has preserved the artist’s work while adding his own artistic touches. A music enthusiast at heart, Birdman relates art styles to music and brings this unique perspective to his photographs. Birdman’s work has been published in Juxtapoz, Very Nearly Almost, Graffiti Art Magazine, American Art Collector, Bliss, and LA CANVAS. As well as in books such as LA Taco 2011, Cryptik: Eastern Philosophies and Shark Toof. He has contributed to 12oz Prophet, Warholian, Street Art News, Brooklyn Street Art, Hi-Fructose and currently is Mass Appeal’s West Coast correspondent. His work has been in numerous exhibitions including: “Wish You Were Here” (solo show, Los Angeles), “LA CANVAS: 80//20” (group show, Los Angeles), “LA is Paradise” (group show, Los Angeles), “Sidewayz” (group show Sydney, Australia ), “Everyday Fantasia” (group shown Sydney, Australia), “TKU and Karmablast Charity Art Show” (group show, Los Angeles), “Oh Brother, Where Art Thou?” (group show, Los Angeles).